2 About QQConnect QQConnect is an add-on utility for QQCatalyst that makes it easy to transfer documents and e- mails from your Windows desktop or desktop applications directly into QQCatalyst. With QQConnect, saving an or other document from your desktop to your contact records in Catalyst is as simple as dragging and dropping or printing a document. QQConnect provides many great capabilities including: Drag and Drop s directly from Microsoft Outlook to QQCatalyst Drag and Drop files directly from Windows Explorer or your Desktop to QQCatalyst Print documents directly from any application to QQCatalyst as a PDF Drag and Drop files from QQCatalyst to create new Microsoft Outlook Upload any file from your Desktop into QQCatalyst Auto match documents and s to QQCatalyst contacts with OCR Match documents through contact and related policies search QQConnect Availability and Pricing QQConnect is included in the monthly subscription price for customers on Q-Max and Plan 4 QQCatalyst plans. QQConnect is available as a paid add-on for all other QQCatalyst plans. You can contact QQSolutions Sales to have QQConnect added to your monthly subscription by calling or ing Please note: QQConnect requires the proper license as noted above. If you are not licensed to use QQConnect, you will not be able to login via the tool and will receive an error. For Microsoft Outlook integration it is recommended that you use the latest version of Outlook. QQConnect supports Microsoft Outlook 2007 and higher on Windows Platforms only. 3 Download and Setup Before downloading and installing QQConnect, please ensure that QQConnect is part of your monthly subscription (Q-Max and Plan-4) or that you have purchased the QQConnect add-on for your other plan. If you have not purchased a license, QQConnect will not allow you to login and you will receive and error. QQConnect is a Windows only application and will not run on non-windows platforms. To Download QQConnect: 1. Navigate to the QQConnect Download Page at the following URL. : aspx 2. Click on the download link to download the application installer. 3. Once downloaded, double click or open the QQConnectInstaller.exe application. 4. Follow the prompts to install QQConnect. To Use QQConnect 1. Open QQConnect from the Start Menu or from the QQConnect desktop shortcut. 2. The first time you run QQConnect, you will be prompted to login to QQCatalyst. 3. Enter your QQCatalyst credentials on the login screen pop-up. 4. After you click the login button, you will receive a prompt to authorize access to QQCatalyst for QQConnect. 5. Click Yes to authorize QQConnect to upload information to QQCatalyst. 4 Drag & Drop (or browse and attach) Files to QQCatalyst QQConnect will run on your desktop and allow you to easily drag & drop (or browse and attach) a file of any type (other than.exe and.dll files) from your PC to QQCatalyst. QQConnect utilizes OCR (Optical Character Recognition) technology that can read your uploaded file to find a policy number, and then attach your file to the appropriate policy directly. To Drag & Drop a file from your computer to QQCatalyst: 1. Begin by left clicking on any file and drag that file* to the QQConnect icon that appears on your desktop. 2. Once you are over the QQConnect icon, release the left mouse button. To attach a file to a contact / policy in QQCatalyst: 1. After you release the mouse button, QQConnect will scan the file being uploaded for policy numbers. 2. If a match is found, QQConnect will attach the file directly to the policy without the need to do any further searching. 3. QQConnect searches across all contact types, allowing you to upload a file to any contact in QQCatalyst. 4. If there is no matching policy or a several possible policy matches are found, QQConnect will display a search window, which allows you to search for any contact and policy to upload the file to. 5 5. The attached file in QQCatalyst will maintain the same file name as that on the file from your computer. *Multiple file upload is not supported at this time. 6 To Browse for and Attach a file from your computer to QQCatalyst: 1. Begin by right clicking on the QQConnect icon that appears on your desktop. 2. Select Browse from the menu that appears. 3. A file browser appears allowing you to search for and select a file* to upload to QQCatalyst. 4. Select a file and click Open. To attach a file to a contact / policy in QQCatalyst: 1. QQConnect will scan the file being uploaded for policy numbers. 2. If a match is found, QQConnect will attach the file directly to the policy without the need to do any further searching. 3. QQConnect searches across all contact types, allowing you to upload a file to any contact in QQCatalyst. 4. If there is no matching policy or a several possible policy matches are found, QQConnect will display a search window, which allows you to search for any contact and policy to upload the file to. 7 5. The attached file in QQCatalyst will maintain the same file name as that on the file from your computer. *Multiple file upload is not supported at this time. 8 Drag & Drop an to QQCatalyst QQConnect works seamlessly with Microsoft Outlook, allowing users to drag & drop s (including attachments) to QQCatalyst. s uploaded to QQCatalyst are stored as files, maintaining the original subject, body, recipients, and attachments. To Drag & Drop an from your computer to QQCatalyst (using Outlook***): 1. Begin by left clicking on any in Microsoft Outlook and drag that to the QQConnect icon on your desktop. 2. Once you are over the QQConnect icon, release mouse button. 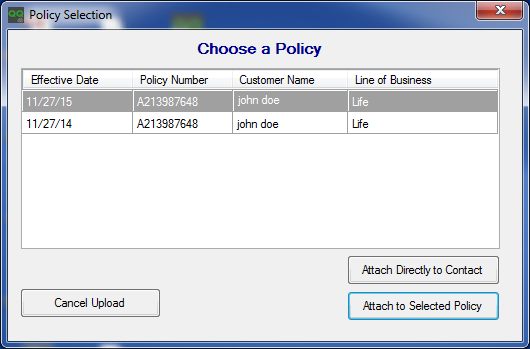 To attach an to a contact / policy in QQCatalyst: 1. After you release the mouse button, QQConnect will scan the entire ** to determine if there is a policy number within the subject, body, or PDF attachments. 2. If a match is found, QQConnect will attach the directly to the policy without the need to do any further searching. 3. QQConnect searches across all contact types, allowing you to upload a file to any contact in QQCatalyst. 4. If there is no matching policy or a several possible policy matches are found, QQConnect will display a search window, which allows you to search for any contact and policy to upload the file to. 9 5. The attached will maintain the subject line as the file name in QQCatalyst. *Multiple upload is not supported at this time. **QQConnect will scan the subject, body, and attachments to find a policy number. *** Drag & Drop is only supported for Outlook 2007 and higher users on Microsoft Windows Platforms. 10 Drag & Drop a file from QQCatalyst to an QQConnect can be used to drag and drop files out of QQCatalyst to create new Microsoft Outlook s that will contain the files you have dropped in the icon as attachments Drag & Drop of files from QQCatalyst is supported from file from the Grid (Thumbnail) View on the files tab of any contact/policy in QQCatalyst. To Drag & Drop a file from QQCatalyst to create an in Outlook* 1. In QQCatalyst, search for a contact or policy. 2. On the chosen contact or policy, click on the Files tab. 3. 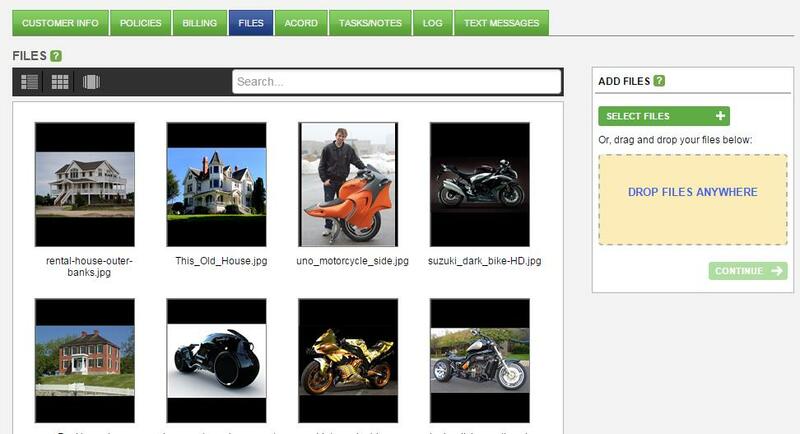 Change the File view to Grid View, click on the icon next to the search field that appears at the top of the Files list. 4. Left click on a file and drag it from QQCatalyst to the QQConnect icon on your desktop. 5. Once you are over the QQConnect icon, release mouse button. 11 6. A message will appear asking if you want to attach more files, if you choose to attach more files, repeat step 4. Otherwise, you can choose to create an using the files you have downloaded. 7. Once you have finished dragging all the files you want from QQCatalyst, QQConnect will open Microsoft Outlook and create an with the files as attachments. 8. Add recipients, a subject and text to your and click Send. * sent outside of QQCatalyst (i.e via Microsoft Outlook) will not be logged as an activity in QQCatalyst. 12 Print to QQCatalyst By installing QQConnect you can also take advantage of QQConnect PDF Upload. This feature is a printer that is added to your PC and is available from any program that allows you to print (or upload) a file of any type directly to a contact / policy within QQCatalyst. To print directly to QQCatalyst 1. Open a file of your choice, any file type is supported (documents, text files, spreadsheet, etc ) 2. Select that file s Print option; choose QQConnect PDF Upload from the list of printers. 3. By default, the name of the printed file will be MyPDF.pdf. 4. You will be prompted to change the name of the file before the upload is complete. 13 To attach the printed file to a contact / policy in QQCatalyst: 1. QQConnect will scan the file being uploaded for policy numbers. 2. If a match is found, QQConnect will attach the file directly to the policy without the need to do any further searching. 3. QQConnect searches across all contact types, allowing you to upload a file to any contact in QQCatalyst. 4. If there is no matching policy or a several possible policy matches are found, QQConnect will display a search window, which allows you to search for any contact and policy to upload the file to. 5. The file that was printed to QQCatalyst will be a pdf file, will maintain the name provided during the upload process. inforouter Microsoft Office Add-in Installation Guide To be able install this add-in, you must have rights to install applications to your desktop. This is usually controlled by your network administrator. DRC INSIGHT Test Engine ACCESS for ELLs 2.0 Field Test DRC INSIGHT DRC INSIGHT is a web-based, online interface used with a combination of software and hardware to provide a secure, online testing environment.